A series of reports from Dagbladet newspaper has raised questions about Norway’s financial support of the Clinton Foundation. Dagbladet first reported that Norway’s contributions to the Clinton Foundation are broken up into sub-groups in order to make the combined contributions appear smaller than they actually are. The foundation, which created by former US President Bill Clinton and has current presumptive candidate for president Hillary Clinton in a key role, reports funds from Norway and the Norwegian Agency for Development Cooperation (Norad) separately and further splits up the support between the different parts of the foundation, each of which reports its own donors. Norad reports that the Norwegian contributions to the Clinton Foundation have amounted to $89.6 million (747 million kroner) between 2007 and 2015, while the Clinton Foundation’s website lists the support as between $10 and $25 million. Dagbladet also pointed out that the Clinton Health Access Initiative, which has been an independent organization since 2010, has received Norwegian financial support that is not reflected amongst the list of donations to the Clinton Foundation. The newspaper then reported that an internal memo from Norad contends that Foreign Minister Børge Brende broke the government’s own foreign aid principles by giving the Clinton Foundation 30 million kroner last year. One of the projects of the foundation was to replace the diesel generators to tropical island nations with energy production from wind, solar or geothermal sources. 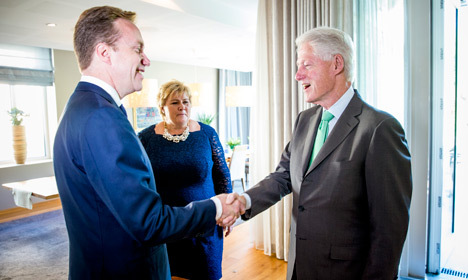 According to the Norad report, Brende chose to disregard his own declared policies when he and PM Erna Solberg met with Bill Clinton last year and promised to support this effort with 30 million kroner. The assistance to the small and scattered island states is not in line with the foreign assistance strategies that the Norwegian government has set for itself and that was approved by parliament. None of the 27 countries included in the Clinton Foundation's program to replace contaminated diesel generators is part of the Norwegian government's list of priority assistance countries. The Foreign Ministry rejects any criticism of the financial support, with ministry spokesperson Guri Solberg telling the newspaper that support through multilateral organizations and initiatives is not covered by government principles in the same way as other assistance. Norway is one of the three countries in the world that gives the most money to the Clinton Foundation. Dagbladet reported that the donations that the Clinton Foundation has received from Australia is also split in the same way as the Norwegian contributions. Swedish contributions to the Clinton Foundation have also been called into question. According to reports from last summer, the bulk of the money deposited in a Swedish arm of the Clinton family's global foundation was transferred while Hillary Clinton was US Secretary of State, and was liaising with Sweden over its controversial business links with Iran.